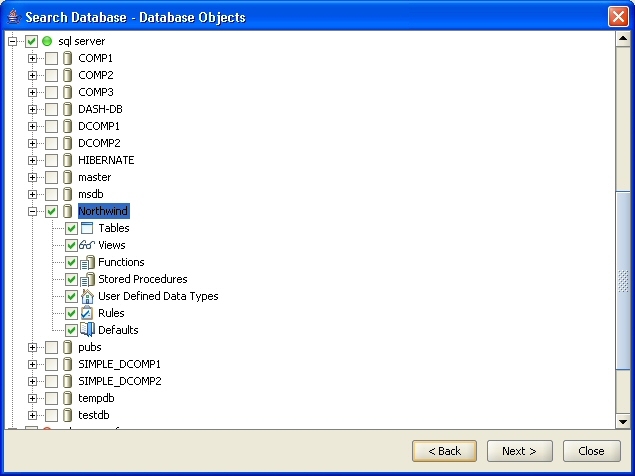 The database search tool allows you to search for database objects whose name or definition contains a certain string. The database search is supported for all DBMS products including Oracle, Cassandra, Vertica, Microsoft SQL Server, DB2, MySQL, etc. You can invoke the search tool from the 'Tools' menu or from the schema browser tree. If you right-click on a server connection, database or schema in the browser tree, you'll see an option named 'Search Database' that will bring up the Database Search Tool. The first screen of the search tool lets you specify the string to be searched for as well as what is included in the search. The Table Options-section lets you choose which sub-objects of tables will be included and the Source Code Search Options section lets you pick which objects' source code will be searched. The second screen of the tool allows you to select the server connections, databases, schemas and object types within them to be included in the search. You can select as many server connections as you wish and for each connection you can check the databases/schemas under it to be included. The leaves of the object tree are the actual object types that will be included in the search. 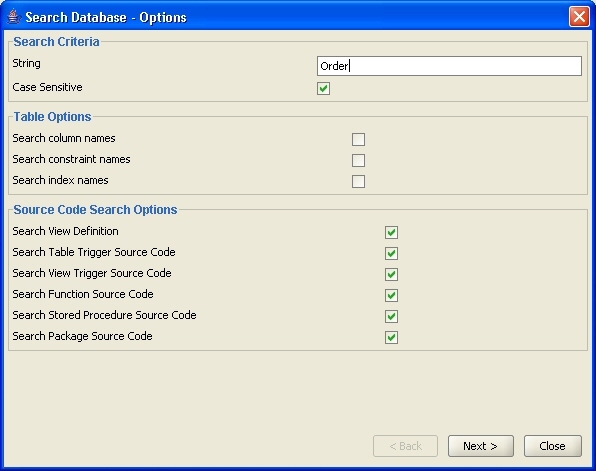 For objects that contain source code, such as procedures and functions, the first page allows you to decide if the source code should be included in the search or not. If the source code is not included in the search (but the object type is still checked in the tree), only the object names are searched. After choosing the search options and selecting the objects to be included in the search, you can start the search process by clicking on the 'Next' button. This will bring up the third screen which will be filled with objects that were found as the search progresses. You can cancel the search at any time if the desired object(s) appear on the list. By clicking on an item in the list, you can view the text that contains the searched string. The text will have the search term highlighted in the details section. 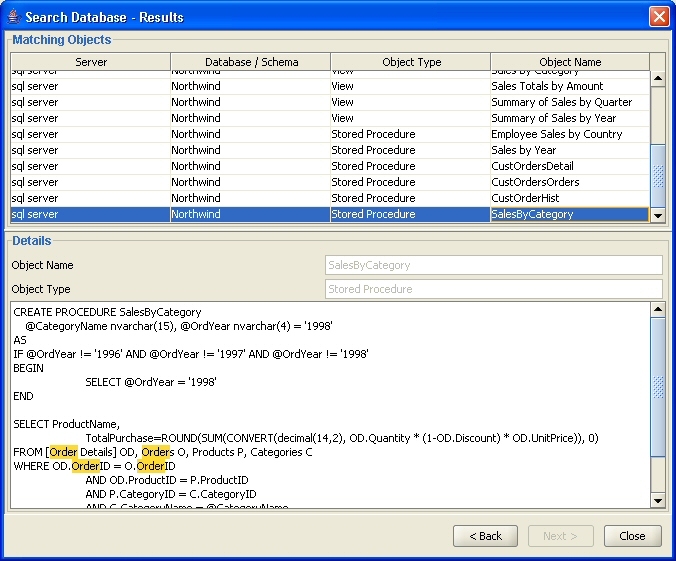 For example, in the case below the search term was 'Order' which was found, among other objects, in a stored procedure named 'SalesByCategory'. Each occurrence of the search term 'Order' is highlighed in the bottom window. If you are not satisfied with the search results, you can go back and modify the options and/or the objects to be included in the search and re-execute the search as many times as you wish. Copyright © 2004-2019 DB Solo LLC. All rights reserved.